Rainy Day Planning Pays Off. Price pressures, tariffs and spring flooding in the Midwest have some farmers and ranchers financially stressed. While the uncertainty has been brewing for a while, economists say they’re beginning to see even more indications of tough times ahead for the ag industry. Are you ready to weather the storm? 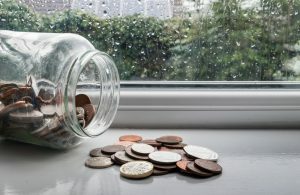 Even if your rainy-day fund is depleted, there are things you can do right now to ward off an even bigger financial crisis. Everybody wants to look at the bottom line, and that’s great, but protect your cash. Look at everything you do – where could you be more efficient? Where are you leaking cash? For a lot of producers those cash leaks come in the form of personal spending. Evaluate your spending and eliminate the things that are not necessary for survival. Are there opportunities to create some additional income without much capital investment? Are there simple diversifications you can make with what you have? Take advantage of skills or equipment you own to provide services to someone else. A major ag downturn in this part of the country means everyone feels the pinch—from implement dealers to Main Street cafes. That said, economic struggles can also be a self-fulfilling prophecy. If everybody thinks things will go bad, then they’ll probably start behaving in a way that could make things go bad. Be optimistic, but just like the farmers and ranchers – guard your cash. In the long term, agriculture will always have a future. People need to eat. There are more and more people and less and less farmland, so simple supply and demand says the outlook is positive. That said, nothing is ever perfect – there are always ups and downs. One of the lessons you can learn from this cycle is that when things are good, it’s OK to put away some of that cash for a rainy day. Rainy day planning will always pay off. If you’d like to learn more about how we can help you weather those rainy days, call or email us today for a free consultation.